First let me state that I am not a biologist. Everything I am stating here are opinions and conclusions I have made based on my observations of the Auburn NY crow roost over the past 12 years. I have studied vast amounts of text on crows and their habits, and have talked and worked with biologists and experts in many fields regarding this and other winter crow roosts. Over the years I have also talked with many citizens and government officials about the problems a roost of this size may cause local residents. Those I have talked and worked with cover the full spectrum of love and hate regarding crows and their roosting habits. For the past several years, crows have chosen downtown Auburn NY for the site of a major winter crow roost. We know from records that at least since the early 1900s, there has been a winter crow roost in or very near downtown Auburn. In the 1990s this roost grew rapidly and now varies between 25-50,000 crows nightly depending on weather conditions and other factors which I will discuss here. Crows are very social. In winter months they seem to gather at night to "discuss" where the best source of food was found during the day. Downtown areas are warmer in the winter months and can offer more shelter from wind than the countryside. Crows also prefer to roost in trees along moving water due to the air above the water being generally warmer. Many "Old Growth" wooded areas which crows preferred to roost in the past have been cut leaving crows to find new winter roost sites. Older trees can be found in city's cemeteries, parks, school campuses, and along city streets. Lights allow crows to see predators at night such as owls, and lighted skies allow the members of the roost to flee from danger. Lights also extend the crows "Social Hour". I have observed crows in the well lighted trees communicating and moving from branch much later than the crows who roost in trees with little or no lighting nearby. One of my theories has always been that the lighting in Auburn is the major factor in why crows picked Auburn and which trees they roost in on a nightly basis. I will present new data here and an example that backs up this theory. In recent years the size of the roost has stabilized. Many feel that the roost has and is still growing in size. I do not agree. From my observations, most who think the roost is "growing" every year do not take into account that the roost is shifting it's actual location on an almost daily basis. This roost covers many city blocks and is considered the largest crow roost in New York State. If crows who usually roost on the south west side suddenly move a few blocks to the east for several nights, the first thing the residents under those trees assume is that the roost has increased in size and now covers their block also. However, if we don't reduce the reasons the crows are attracted to downtown, there is little hope that the roost will leave any time in the future. Although the center of the roost, which I will call "Ground Zero" for lack of a better term, has stayed pretty much in the same location along the Owasco outlet for the past 10-12 years, the over flow trees used by crows that can't roost in the preferred roosting trees once they are full, changes on an almost nightly basis. There is one exception to the crows habit of choosing these outer roost trees depending on weather. I have observed over several years that the crows almost always choose trees that are near lighting first if a tree along the outlet is not available. Lighting it seems, is the root of the crow problem. The intensity of the light in downtown Auburn has increased dramaticly since the early 90s. Newly available satellite data shows that the center of the highest intensity of light has made a major shift from the Grant Ave. area (car lots and major retail stores) in the north east of the city to downtown Auburn. If crows are attracted to well lit trees, increasing the lights around the older trees downtown that offer warmer air just adds to the problem. If you give crows more well lit trees to roost in, you are increasing the potential for a larger roost. This is exactly what has happened between 1992 and 2000 to increase the size of the roost to its current population in downtown Auburn. The following NOAA satellite data was acquired from the National Environmental satellite Data and Information Service. It shows that the level of light Auburn generated in 1992 (before the roost dramatically increased in size) was centered in the outer Grant Ave. area. Notice that the level of light in 2000 has not only increased, but now covers a wider area and the center has shifted from outer Grant Ave. to directly over downtown Auburn. This coincides with the same years that the crow roost grew to its current size. The satellite data below shows the light shift to downtown and increase in light since 1992. The intensity numbers used above are for comparison between data sets only and do not relate to any lighting "scale". What's caused the shift and increase in lighting? In the early 90s, the city streets such as South St. and Genesee Street, had fewer street lamps than they have today. 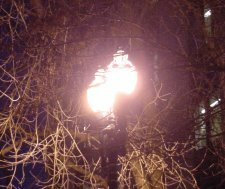 The older lamps were less in number, produced less light, and most important, they did not radiate light upwards into the night sky. Lamps generally had a reflector to focus light toward the ground, not up into the trees. The older lamps were not as bright. There was not enough light from the sides to reflect off structures and light up the night sky. New period lighting Starting in the mid 90s, street lights in the downtown area have systematically been replaced by "period lighting". The number of lights along several downtown blocks has increased and in some areas the number of light poles looks to have doubled. 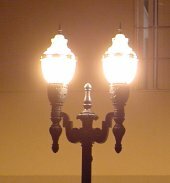 Many areas which once had one lamp on a single pole now have two significantly brighter lamps on one pole in the same location. At the same time, the new bulbs produce a much higher amount of light. Add to this the fact that the design of the new lighting radiates light in all directions, including directly up into the sky where it is not needed. Remember, one of the main theories is that crows like to roost in lighted areas to help them see predators. Lights that shine up into the air and reflect off buildings and into the sky allow crows to see predators and fly from tree to tree to socialize after dark. This fall, crows became a problem around the County office building on Genesee Street. Why after so many years in downtown did crows start roosting in the trees right in front of the building and next to the parking lot? In the past they were only there for an hour or two if at all. What changed to make the crows roost in these smaller trees all night? This fall (2004) the City finished its Genesee Street revitalization project in front of the County Office Building. As you can guess, the city installed the new style street lights. Where there were once single, dimmer lamps shining down to the ground, there are now huge, bright, double globes shinning light in all directions. One of these new double poles was even placed away from the road, right in the middle of a tree on the other side of the sidewalk in front of the County Office Building. As you can guess, the crows this winter have chosen to roost in that tree also. The crows nightly droppings now cover the sidewalk on both sides of the County Office Building's front doors. For the past ten years the City has been hearing experts say that lights attract crows, but in the same time period the city has been talking about the crow problem, they have been making downtown Auburn a much more attractive place for crows to roost. New lamps now line both sides of Genesee Street If the city continues to install this type of lighting, it will increase nighttime light level and invite even more crows roost here. If nothing is done to reduce the amount of light the newer lamps project into the sky, there will be little hope of convincing a majority of the crows to move to another location. The City of Auburn is now utilizing scare tactics to attempt to move the roost from the city. If it is even slightly successful, it will be temporary at best and will have to be repeated several times every winter. My hope is that this data will show that the new lighting is a major factor in the crows attraction to downtown and that unless you make changes to what attracts crow roosts in the first place, cities will continue to spend taxpayer's money attempting to relocate roosts every winter.